Almost every night, we closed the evening with sing-alongs in Joseph and Sarah's room. 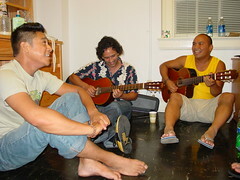 There's R.A. Villanueva, John Wei, and Patrick Rosal entertaining us. They're DAMN good.